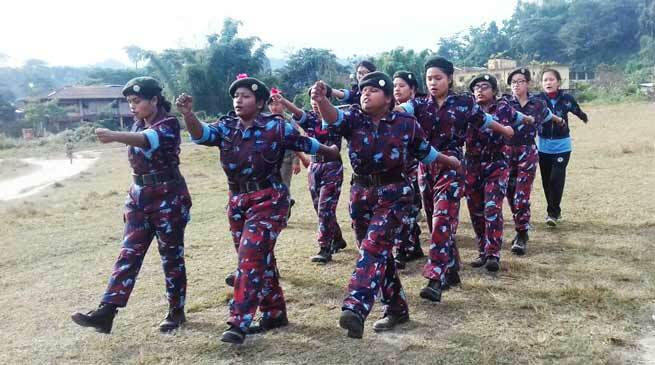 A Combined Annual Training Camp organised by the 1 Arunachal Pradesh Bn NCC is underway at RGGP Itanagar from 01 Jan to 10 Jan, 2018 in which around 400 Cadets (Boys and Girls) are participating from Arunachal Pradesh and Assam. A number of activities are planned for this ten day long Camp which includes Swachh Bharat, Weapon Training, Firing, Drill Practice, Cultural Programme, Tent pitching, Lectures on Health Hygiene and other Social issues to instill bonhomie and Leadership qualities in the Cadets. To train these cadets and to conduct various activities Instructors/NCC Officers from schools/colleges accompanying the cadets as ANO/CTOs (Associate NCC Officer/ Care taker Officer) along with 20 Army instructors are also participating in the camp under the supervision of Camp commandant, Lt Col NK Bishnoi, SM. NCC not only motivates these cadets but also serves as an example to the society through various activities carried out by NCC cadets. Blood donation camps swachh Bharat misson ,literacy awareness, conversation of natural resources, are some of the activities in which the cadets participate round the year. Carrying of arms openly in public- Is it appropriate ?